The CONTOUR® NEXT LINK 2.4 blood glucose meter from Ascensia is the only available meter designed to communicate wirelessly with the MiniMed® 640G insulin pump for seamless integration. The CONTOUR®NEXT LINK 2.4 blood glucose meter comes complimentary with your MiniMed® 640G. Discreet remote bolus dosing at the touch of a button. 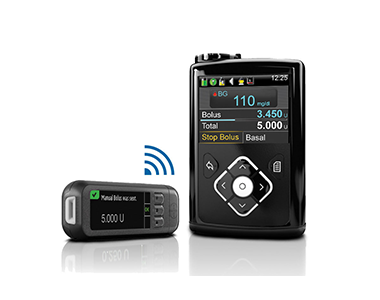 Send a manual or pre-set bolus dose directly from the CONTOUR®NEXT LINK 2.4 meter to your MiniMed® 640G insulin pump’s Bolus Wizard. The Bolus Wizard™ calculates and recommends correct insulin doses1 automatically, so you can manage your insulin more conveniently and precisely. It can also help reduce the risk of data entry mistake. MultiPulse technology ensures more accurate glucose measurements, even when blood glucose levels are low2. Find answers to popular questions about blood glucose meters. Calculation is based on the amount of insulin currently in the body, the amount of carbohydrates, the user’s current and target blood sugar levels, their insulin-to-carb ratio and their body’s sensitivity to insulin. Proper Bolus Wizard™ setup must be completed first. Users must input the number of carbohydrates they are eating and their current blood glucose value before the Bolus Wizard™ can calculate the insulin users should take. See CONTOUR®NEXT LINK 2.4 package insert for list of substances and medications.